One is majorly spoiled living in Northern California. No matter the time of the year, one can step right out their front door and, if they’re quick with their camera, find a supermodel sensation from a previous season passing you by. 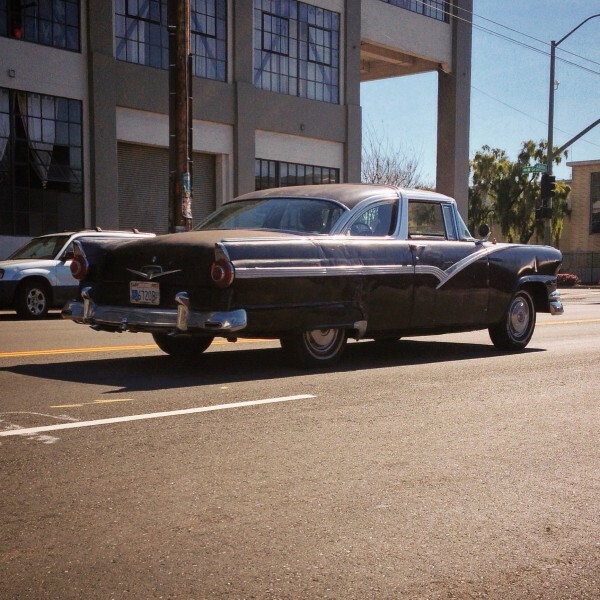 This particular 1956 Ford Crown Victoria particularly likes to draw me in on its daily errands up and down Adeline Street here in the McClymonds district of Oakland. Each time it speedboats by, I get lost in reverie, imagining the story it might tell. I’m not only fascinated by the mere thought of this hunk of Dearborn design, but also with the story that sees it in daily service nearly 60 years later. It’s a pretty eager old beauty that’s found running all sorts of errands at all hours of the day. The burble of the Y-Block V8 reveals no exhaustion in competing with the Prii, W123s, Jetta TDIs and donked out GM B- H- and W-bodies that comprise the majority of West Oakland’s vehicular population. She’s not the oldest daily in the motley fleet of longtime residents and gentrifiers; by my observation, that honor goes to the 1949 Plymouth across the street. Despite the newer California Disabled Person plates, I can’t wait to catch it at rest to hear both its engine and the current owner’s story. It does seem like a much beloved family heirloom, found parked in front of a West Oakland Victorian full of Dinah Washington records, Formica tables, and other ephemera from The Great Migration. Until then, I have to deal with the fact that this old dog still finds itself an eager puppy, eager to live another day among the young rather than wither away as either a museum piece–or worse. Until then, I can smile at the fact that in so many ways it–and the folks that have given it a home–have avoided the multiple Cruella De Vils of Oakland life over the last 60 years. What a gem. And who cares if it’s not in showroom condition. How beautiful that this old beast is still used as a daily driver 60 years on. That Vic is absolutely perfect. The scuffs and dings just add to its character! 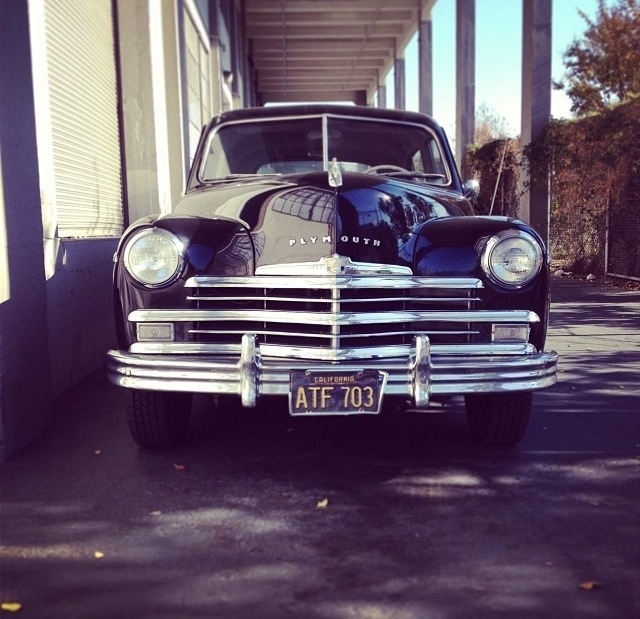 The ’56 Crown Vic was precisely named. It was in fact the Crowning Victory of Fordness. After ’56 the family-owned company became just another Wall Street-owned corporation and lost track of Fordness. You’ve got to love it’s original condition and patina… It gives this ole warrior some character. The Plymouth gets a more sparing workout, and oddly comes out more often after dark, but is quite visible and unguarded during the day. I’d seen it over the last 4-5 years but by happenstance ended up moving across the street from it 18 months ago. The neighborhood is particularly swimming with classics, alongside my own 280 SE 4.5, before you even leave my Duplex my upstairs neighbor has a late 70’s 280Z, a 1979 Firebird and just bought a 1980 240D. The vast majority of the classics tend to be mid-to late 60’s Mopar A-bodies, Falcons and their cheaper derivatives, Cadillacs and other big GM C bodies and an insane number of Mercedes Benzes from 1966-80. That first photo is spectacular. Yet another great write-up, Laurence. That “basket handle”between the front and rear side windows kind of foreshadows the landau-brougham roofs of the `70s. Wonder if the rear side windows roll down? Nice car, good to see that its still in use. I just saw a pic on the Abandoned and Neglected Autos facebook page of a derelict Crown Vic with the rear quarter window part way down. Good find Laurence. Used to get a lot of thumbs up when I was driving my 57 and miss that. I owned a 55 Ford which is almost the same car. Not teen proof but pretty rugged. Beautifully written, Laurence. And a find so foreign to we Midwesterners. The only time these are seen hereabouts is in restored form among other sparkly classic iron while 50s-60s tunes pour from the PA system. 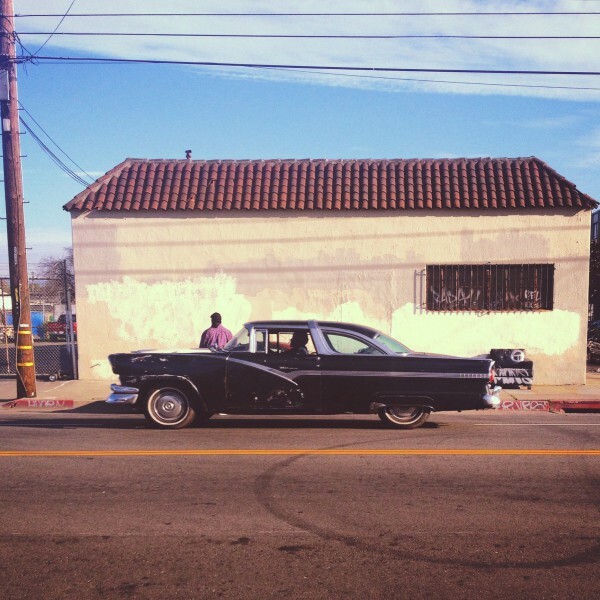 Your lush photography captures the car in action, a completely different experience. Bravo! These Crown Vics were pretty rare in the Midwest when they were new. As a little kid, I was crazy about them – the uniqueness really appealed and I loved the “crown” basket handle. Plus those you saw tended to be loaded with options. One of my most prized possessions was a yellow F&F plastic Crown Vic, similar to the one below, that came free with Post cereal. I had a big collection of 55 Fords (including an ambulance and fire chief car) from eating as much cereal as I could. Today I don’t see the Crown Vics on the streets of SoCal but definitely at car shows and meets. Thanks, Laurence, great photos and article on a unique car. The care that has obviously been afforded this car is probably on the inside among its mechanicals. Bodywork and paint can come later in this benign climate. I’m thinking that this car’s owner knows what he has. Beautiful car,thank you Laurence.CC effect strikes again as I asked about a black and white Crown Victoria featured in apiece about a later model. My brother raced one of these that he put a 427, 8 barrels of carbs into. His was an aqua and white hardtop. What with all the “love” given the “Tri-Five” Chevvies; many of us forget just how awesome the ’55-’56 Fords really are. +1 was there a Mercury equivalent? 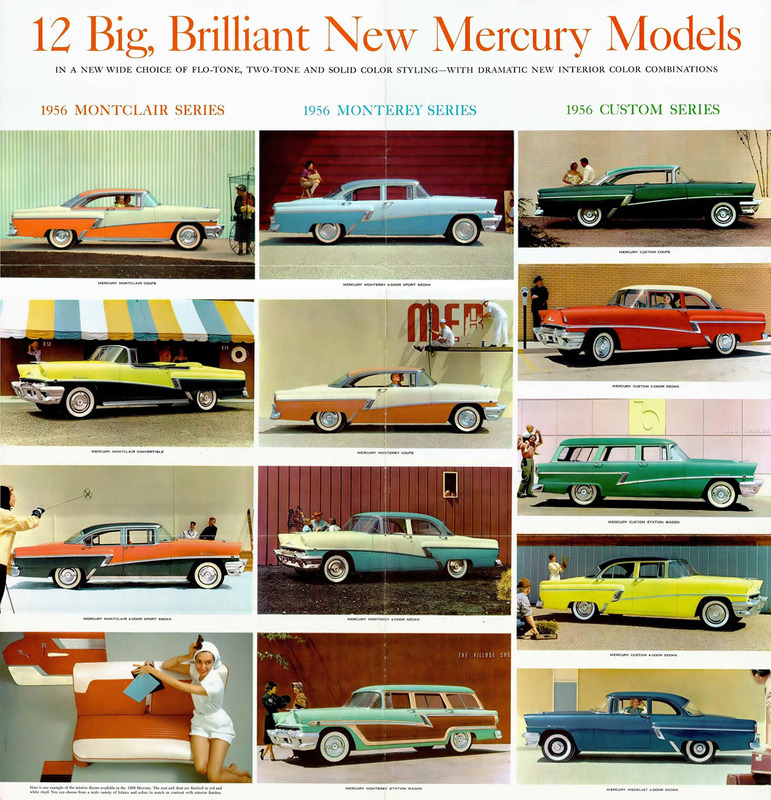 Yes, the mercury Crown Montclair. Don’t believe the “Crown Montclair” was an actual production model (see official brochure below). The basket handle Crown Vic was a Ford exclusive. The really cool Crown Vic was the Skyliner model with the green plexiglass roof in front of the basket handle. Recall that it cast an eerie green glow over the interior. Quite hot as well, in these days before ubiquitous A/C. Apparently it also scratched easily and was gone after this year. A very stylish car in a year with many stylish cars. 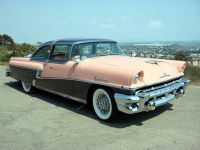 The Skyliner did have a Mercury precedent though–the Sun Valley, which was available along with the Ford Crestline Skyliner for ’54 with the same acrylic panel. I know that Mercury offered the Sun Valley model, which was the Merc version of the car with the plexiglass roof (1954-55 only). I have never seen a Merc with the Crown Vic treatment, though. 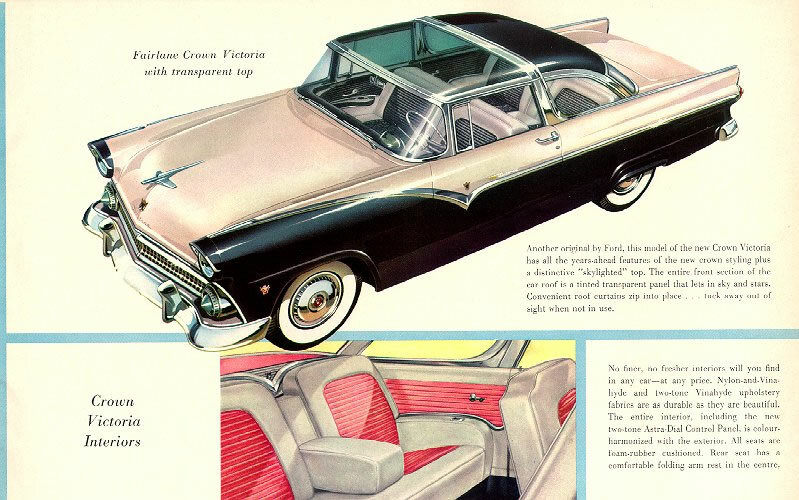 That’s correct JP, Merc did have a plexiglass roof model in 54 & 55 (the Sun Valley), but only the Ford Crown VIc had the unique basket handle roof treatment. The basket handle motif carried over to the interior, where it was finished in bright stainless steel. The glass roofs disappeared after 1956, not to be seen again until the Vista Cruisers and Buick Sportswagons in 1964. 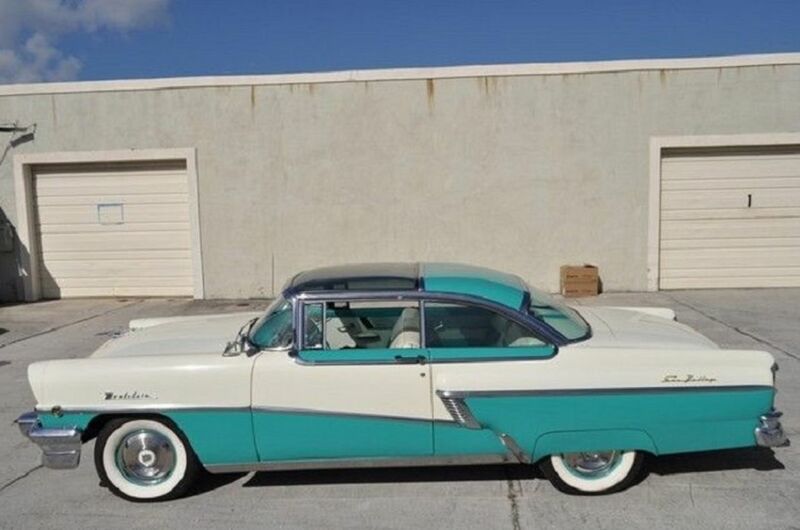 The turquoise and white Sun Valley is a 1956 model. 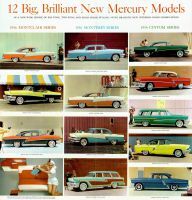 The old Special Interest Autos magazine reported in their Drive-report article on the ’55 Crown Victoria on the Mercury variants including a handful of ’56 Montclair Sun Valleys having been produced. Wonder if this car is one or the unique parts from a ’55 Sun Valley fitted to at ’56? I have seen several of these at car shows, but have not yet had the opportunity to turn a wrench on one. They are gorgeous cars. I think it is great that they were available ONLY as 2 door models. Kind of sad that when most people think of the Crown Victoria, they think of the 4 door cop car. That name used to belong to a car with real style. Wow; pretty amazing that this ’56 is in daily use! The wonders of California… We do have some ’50s iron that sees the road regularly around here, but I don’t think any of them get quite the daily workout that this one seems to. Nice find Laurence and great writing and photography, as always! Beautiful find, Laurence! Fords of this vintage are an exceedingly rare sight here in Arizona, for some reason. Growing up, I saw a number of these, along with their two- and four-door hardtop and sedan siblings. Once in a great while, I would see even a Crown Victoria Skyliner, with the green-tinted plastic skylight–not one of Ford’s better ideas! I like the ’55-’56 Fords better visually than their Chevy counterparts. The Fords look cleaner to me, with sharper, crisper angles. I had forgotten, too, how good these cars look with fender skirts. As for the “basket handle,” it works so much better on this car than when Ford resurrected it in the 1970s. I’m going to guess that the rear windows rolled down, just like all the other ’56 Fords. Air conditioning was available, but still very uncommon at this time. I may be the lone dissenter here. I love the 55-56 Fairlane just as much as you do (with the 56 being the best of the pair), but find the chromed basket handle roof on these just a bit much. I like the car in spite of the roof treatment rather than because of it. The regular 56 Fairlane hardtop was so graceful, the monstrous chrome B pillar sort of wrecks it for me. But the Crown Vic model was such a rarity, of course we all love it now. Seconded. To me its a 2 dr sedan in a party frock. A genuine pillarless hardtop is hard to beat. Come up to Scottsdale for the Scottsdale Pavillions car show every Saturday night, you’re sure to see at least a couple. But they are becoming too rare and valuable to use as daily drivers anymore. cost 2920.00 bucks.Loved that car. As usual , stunning photo of a very nice car . I remember these well , they were always quite popular on the used car market so I could never afford one , more’s the pity as this Bowtie Guy would happily drive the wheels off it . Sounds like your housing situation is more settled now too , that’s good to hear . More of your excellent writeups please . A lovely automobile, it’s great to see it still on the road. I see more and more young people actually using older cars. I know a lot are dead grandma/great aunt cars that will go to the recycler as soon as something big breaks, but many are obviously a point of pride and affection for these young folks. I don’t care for the aftermarket wheels and more extroverted paint jobs that many go for, but if it keeps these old girls on the road, Godspeed to them. In the early 80s I was stationed in northern California and yes, one of the perks of that area is the interesting assortment of cars you see everywhere. Just a small comment though: if this car came from the factory as a black and white Crown Victoria wouldn’t more of the car have been white? It looks like a solid black CV that had a white hood added at some point. Someone here in Jacksonville has a 55 or 56 Ford 4 door sedan that is black and white. The burble of it’s V8 engine is wonderful, I almost envy the owner. I say almost because I would prefer a 2 door model. I don’t care if it’s a sedan, hardtop, or wagon…in fact a 2 door wagon would be great. Beautiful, Laurence. Cool car, contented owner, widespread public good. I’ll take all you can find. 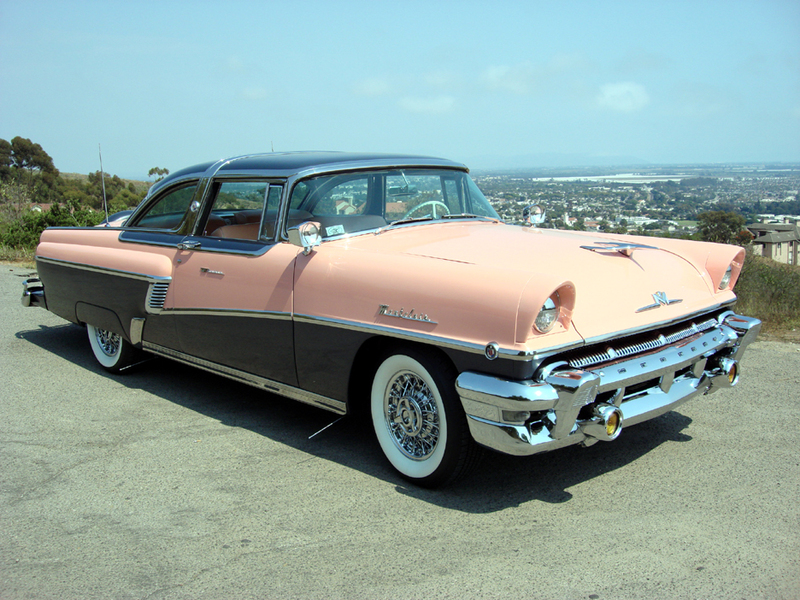 My grandparents had a ’56 Customline Victoria hardtop, six with stick shift! In black and white! How I wish that car had been put away until now! Crown Victorias, as nice as they are, are everywhere at car shows but no Customlines to see seen anywhere. Great find, actually they seem to be finding you! 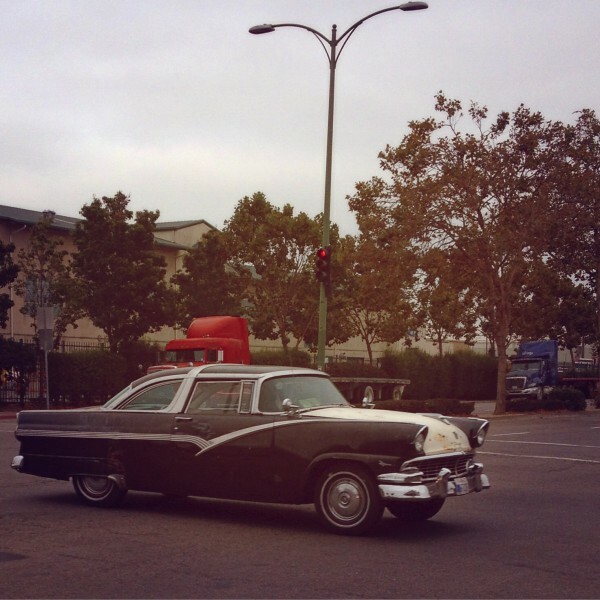 It’ s really refreshing when you see an old car being used daily. Especially when the exterior is in unrestored or unmodified condition. Obviously the mechanicals have been taken care of. Just saw a beautiful 67 Impala fastback at the corner gas station. It was a lowrider but except for a few extra accessories the body was stock..There are a lot of late 40s bombs and fifties lowriders seen on the streets. They are usually immaculate, as a lot of clubs will not allow a member to drive an unfinished car. I still see a lot of other cars and trucks driven in the process of being fixed up. Great write-up and photography! Although overshadowed by the Tri-Five Chevys in popularity, the ’55 and ’56 Fords are very nicely styled, always liked them! A lot of the 52-54 Fords lives on under the sheet metal. Ford designers did a great job in their changes for the 55-56 models, much as Chevy designers did in hiding the previous models under their 57 effort. I didn’t know this until fairly recently, but it’s not surprising given the resources that had to be expended to design and tool for all-new sheet metal. Even today as Paul has pointed out on numerous occasions, the basic “bones” of a platform remain the same even for so-called full redesigns. Yep. Most people don’t know that the “Bold New” (LOL!) 2015 Camry still uses a platform first produced for the 2001 model year! I know I’m generally a ‘Ford person’, but I would take one of these over a 1957 Chevrolet any day of the year. Such a beautiful, graceful, and dynamic looking car. I’ve never understood why it was the Chevrolet that became the design icon of the mid-1950’s. The ‘basket’ trim may be (pun alert!) a little over the top, but it’s well integrated and the forward slant adds a nice sense of forward motion (and more than a little drama) to a great basic design. A stunner. I have been a Mopar guy, then a GM guy, and now own 2 Fords. I do not really like any new cars (and in some cases that has just as much to do with all their electronic, computerized, emissions and safety crap as it does the looks or performance of the car. I have dreamed about taking an ’05-’14 Mustang, gutting it, and rebuilding it with early ’70s technology) So now I consider myself just a vintage car guy, with a strong preference for American cars and air cooled VWs. I loved these Fords then, and I love them now, but the photography makes them even more special. Laurence, you really have to publish a book of your photos. I used to deliver that very neighborhood for UPS about 25 years ago, back then there were some interesting Old Car Guys roaming about Adeline ave & Market Street.